In the Time Clock area, select the employee(s). Click View Schedule. 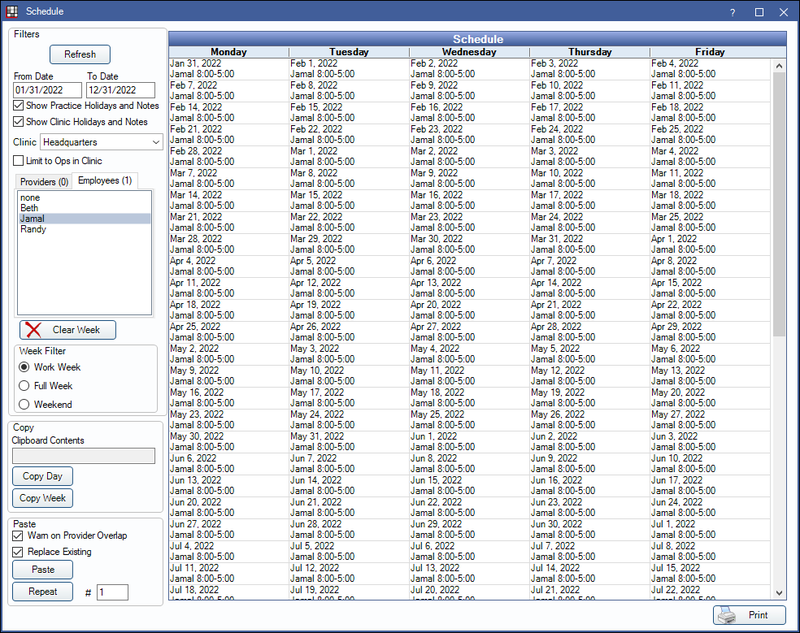 Employee schedules can be quickly viewed and printed from the Manage Module. The view will default to the current week's schedule plus four weeks. For most users, the view is read-only. The options available to these users are described below. Users with the Schedules - Practice and Provider security permission will access a view that allows them to edit schedules as well. See Schedule Setup. Filter Options: If you change a filter criteria, click Refresh to update. From Date and To Date: Customize the date range. Show Practice Holidays and Notes: Show practice notes and holidays. Show Clinic Holidays and Notes: Only an option when clinics is turned on. Show the selected clinic's holidays and notes entered. Clinic: Only an option when clinics is turned on. Filter the view by clinic. Show Schedule Filtered by Clinic: Only an option when Clinics is turned on. Check the box to quickly select all providers and employees associated with the selected clinic and view their scheduled time blocks. While in this view, all buttons in the lower left are disabled and schedules can't be edited. Provider: Select the provider schedules to view. Employees: Select the employee schedules to view. Show weekends: Show Sunday and Saturday schedules.